I needed something springy today. The sun is up earlier and earlier, which puts joy in my heart. It also gives me the expectation that the temps will be warmer, and I will be able to get out and do some yard work and gardening. But it's in the teens this morning! I just need to enjoy this time, listen to the cardinals singing their February song, and be patient! So here's something that looks springy, even though it's flowers that were in my garden in September. 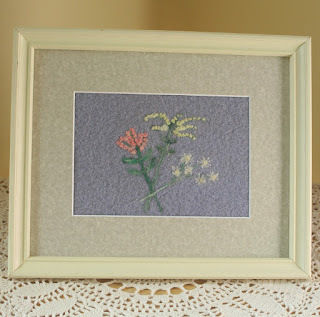 They are needle felted onto a background made from a boiled wool jacket. 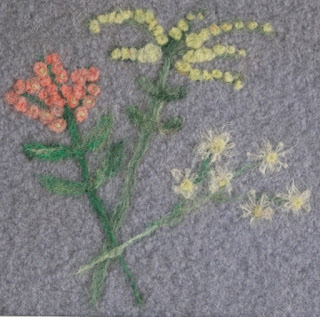 The flowers are "Obedience" (or "Obedient Plant"), goldenrod, and fleabane.